dbnAudile create chemistry in Barcelona! 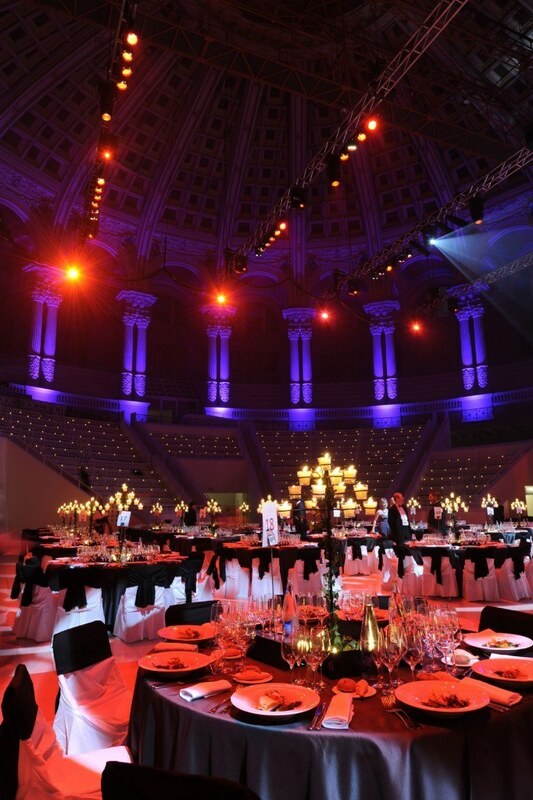 dbnAudile transported their creative and technical skills, equipment, and crew to Barcelona, to light the annual sales Conference and Gala Dinner/Awards event for a major pharmaceutical multinational. Working for live events specialist WRG Creative Communication, dbnAudile’s Stephen Page designed lighting for the 2 staged elements of the event. 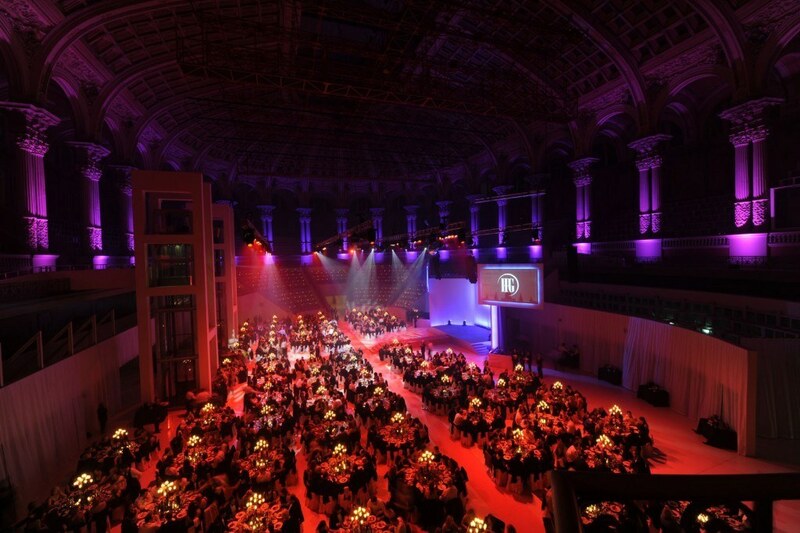 The Gala Dinner/Awards for about 1000 delegates was held in the Salle Oval (Oval Room) of The Museu Nacional d’Art de Catalunya (MNAC) housed in the magnificent Palau Nacional. This was originally built for the 1929 World’s Fair and is situated in the prime location of Montjuïc Hill at the end of Avenguda de la Reina Maria Cristina. The stage was built traversing the room with a set designed by Robin Thompson, which was lit with a combination of ChromaQ DB4 MkII LED battens, some positioned on the floor up-lighting, and others ensconced into the ends of the set. In the roof, the dbnAudile crew of 8 installed 4 x 30 metre mini-beam trusses to facilitate the hanging of lighting fixtures in all the right positions to illuminate the tables, the floor, the room and the stage. “The challenge was in producing a spectacle for the show that would include highlighting the amazing architecture in a tasteful manner." A myriad of Source Four PAR bars were used to wash the entire space in red, and then overlaid various colour and gobo looks from 56 moving lights. These were a mix of fixtures from the Clay Paky Alpha range, including 1200, 575 and 300 HPEs, 575 TH Washes and Alpha Beam 300s – all chosen to add flexibility and panache to the visual options. The 300 series fixtures were used to light the stage from above, while the rest were concentrated on making up general floor and room looks. Also on the stage were 2 Studio Due CS4 bars, hung on the back truss of a 4 legged trapezoidal ground support system which was also supplied and built by dbnAudile. The ground support measured 6 metres high and had a 6 metre wide back truss and two 6 metre side wings. Twenty-eight i-Pix BB4 LED wash lights were used highly effectively to up-light the pillars surrounding the room, which stretch from balcony level to the ceiling, in a variety of cool colours. Page programmed and controlled all the lights on a Jands Vista T2 console. The week-long Conference part of the event took place across town at the Barcelona International Convention Centre (CCIB), a 67,000-square metre building designed by Josep Lluís Mateo. This featured an in-the-round stage with a central catwalk, also designed by Robin Thompson. dbnAudile’s brief was to provide a simple and utilitarian white wash and ‘house’ lighting with a little touch of extra special pizzazz. With the latter in mind, to add colour and texture to the walls of the venue, custom gobos were created for 10 Clay Paky Alpha Wash 1200 fixtures. The white lighting states were produced by a series of Source Four Profiles and PARs together with ARRI 2K fresnels, all driven from a Jands Vista console, programmed and operated by DBN’s Pete Robinson. “We enjoy a fabulous working relationship with WRG. We hope that the delegates went away with a memorable experience."